Get your site listed on the top page of Google, Yahoo, and Bing.We have affordable web solutions for all. Use our Marketing knowledge to promote your business. We analyse your site and exposure to the web and show you what we can do. No smoke and mirrors approach. We get your business results fast and in a cost effective maner. There is a lot to consider if you are looking for a Professional Web Design. So let’s get to it. First and for most there are a lot of web design companies out there that promise true results with a Professional Web Design. A lot of it is just plain old Bull! A good Professional Web Designer will come highly recommended and not be afraid to let you see and speak with their clients. If you can’t get a referral then move on to the next professional web designer. Next is how many sites have they actually completed? I they can’t produce a complete site that is easily found on Google, Yahoo, and Bing then once again take a hike buddy! The next big issue to tackle when considering Professional Web Design is how are they at marketing your site? If you purchase a website and then it can’t be found in the search engines than what’s the point, right? Now that we have the basics out of the way let’s look at some key terms that will help you understand better your site should have. First is the term SEO(Search Engine Optimization). SEO is defined as the process of improving ranking in search engine results. That means if your web site sells office furniture that if it type in “office furniture” into Google, Yahoo, or Bing that your site comes up on page one and not page 100. The next term is SERP (Search Engine Results Page) this is the listing of web pages returned by a search engine in response to a keyword query. Below you can look at some of our latest projects. We are proud of our client list and allow our new customers to speak with our existing customer base. 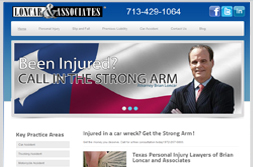 We pride ourselfs on our web design and web marketing capabilities.